Nice to hear from you. I have travelled a little. When I was in the army I went to Aden, (Yemen, South Arabia), and to Minden in northern Germany. I was also stationed in Edinburgh, (Scotland), but as that is in the UK, it doesn't really count. I would like to have travelled some more, but I don't think it likely now. I have an illness called multiple sclerosis, which will never get better, only some days are better than others. If you came over here I think the place I would take you is Durham City. It's a small city, but a very beautiful one with a river flowing through a high banked valley. It forms a great loop, and in the centre, a high hill. On the top of the hill is Durham castle and cathedral. The cathedral is very old, and very tall. It is the burial place of St. Cuthbert who brought christianity to the north. There are at lot of narrow winding streets, but some new shopping centres as well. All new buildings have to blend in with the historical architecture. We also have a University there, and students come from all over the country. The other thing I like about Durham is there are a lot of trees all around. The cathedral seems to emerge from a steep bank of trees. Here is a photo of the cathedral emerging from the trees. Glad to hear you are keeping well. It is starting to get cold here now too, and we are getting frost on the ground at night. I guess my hero would be Prof. Stephen Hawking, because although he has motor neuron desease very bad, (he can hardly move at all now), is still one of the leading minds in his field, (theoretical physics), and ranks with Newton. Much of his work will not be realised for years yet. I am married with three grown-up daughters, and nine grandchildren. I also have a dog called Rebel, and golden retreiver. He is 12 year old now, but still thinks he is a puppy. If you were to visit me here, I think I would show you our county, which is know as "The Land of the Prince Bishops". That's because it was ruled by the Bishop of Durham. His Coat-of-Arms has a bishops mitre set in a crown, that's because he had the same powers as a prince, (to raise an army, collect taxes etc). 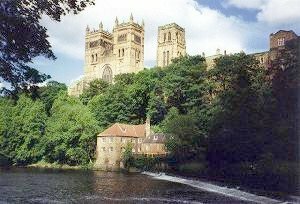 Durham City is very old, with a castle and cathedral with can be seen for miles. When I was coming home on leave from the army, and saw the cathedral, I knew I was home. 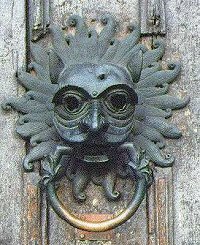 The cathedral is the burial place of St. Cuthbert, and on the front door is a huge lion's head knocker. Anyone wanting sanctuary had to knock on the door with this knocker. I'll send you a photo of it. Well there are a lot of places I could take you. Perhaps to the Farne Islands, and see the seal colony, or to Holy Island, where Christianity was brought to the north. Or perhaps I would take you to Washington, (County Durham), where George Washington's family lived, (before he became your first President).